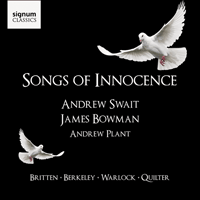 The initial impetus for Songs of Innocence came from Andrew Swait who was extremely keen to investigate repertoire rarely sung by a treble; indeed, several of the songs featured are world premiere recordings. After rehearsals with Andrew Plant in the summer of 2007, Andrew Swait’s immense enthusiasm for Britten’s unpublished student works was soon evident and is as evident in this fresh recording a year on. A wonderful collaboration of English and American twentieth century song. The initial impetus for this CD came from Andrew Swait, the latest in a line of distinguished boy singers, who was extremely keen to investigate repertoire rarely sung by a treble. We began rehearsing together during the few glorious summer days of 2007, in two environments eminently suited to the exploration of English song: The Britten-Pears Library at Aldeburgh, and a large Victorian farmhouse set in spacious grounds overlooking the Malvern Hills. Andrew’s immense enthusiasm and advanced sight-singing abilities enabled us to work through a great quantity of music, most of which he then seized with alacrity and added to an overflowing pile marked YES, DEFINITELY. During the inevitable sifting, the programme underwent a subtle metamorphosis to ‘Song in English’, in order to accommodate immoveable items by the American Charles Ives and the Australian Malcolm Williamson. Central to the project were unpublished student works by the young Britten, who at the time of their composition was not much older than the boy now singing them into life for the first time. These early songs were all written within a few months of each other, during the composer’s schooldays and his time of tutelage under Frank Bridge. It is fascinating to trace how rapidly the young composer absorbed his mentor’s teachings but it should not be thought for a moment that they represent the boy’s entire output over eighteen months. Indeed, it is salutary to reflect that by the time the first was completed, such masterpieces as the Quatre Chansons françaises were already six months behind him. In allotting these items to treble and counter tenor, it should be remembered that the composer himself was by no means averse to recasting his music for different singers. The haunting ‘Corpus Christi carol’ from his choral work A Boy was Born was later adapted for the boy alto John Hahessy, who recorded it with Britten. Also included on that disc was the composer’s The Birds (contemporary with the four early songs on this CD) and items from Friday Afternoons, for which he was joined by another treble from his choir at Westminster Cathedral: Britten’s godson, Michael Berkeley. Hahessy also recorded Britten’s Canticle II ‘Abraham and Isaac’, with Pears and the composer, after the untimely death of Kathleen Ferrier, for whom the part had originally been written. Britten was, of course, supremely familiar with the art of James Bowman, writing for his voice in Canticle IV ‘Journey of the Magi’ and his last opera, Death in Venice. He also made a transposition of his Purcell realisation Sweeter than Roses specifically for James. Diverse, confident and splendidly paced, the four songs exhibit a sound harmonic sense, effective and economical piano writing and a natural understanding of vocal theatre. All these qualities are most evident in the earliest, Witches’ song (5), the first eight lines from the third ‘Charm’ in Ben Jonson’s The Masque of Queens. Britten, always a lover of nocturnes, set them to a restlessly swirling accompaniment with Schubertian oscillations from minor to major, although Mendelssohn’s Hexenlied also comes to mind. It is here transposed down a tone from the original, since the eerie vision is most suitable for a singer who was the definitive Oberon of his time. This song was written on 21 February 1929; a few months later, between 6 May and 16 June, came Tennyson’s The Owl (4), the fifteen-year-old composer evidently revelling in the young poet’s cheerful evocation of early morning activities. The vocal line of this setting, founded on rising and falling scales, covers almost two octaves. One suspects that a more mature hand might well have revised one or two phrases and it is here transposed up a minor third from the original. The cadence at the end of each verse implies a modulation to the dominant but the masterstroke is reserved for the final bars, where three ghostly calls from the hidden bird (or are they perhaps distant bells?) close the song quizzically on remote and unresolved chords of the supertonic seventh. Diaphenia (3) followed between 4 and 8 September, a more conventional essay which nonetheless employs some delicate keyboard writing over a wide compass and displays the composer’s burgeoning melodic powers. Britten assigned it to a tenor voice. It is now generally believed that Constable is the author of the poem (fully titled Damelus’ Song to his Diaphenia) although it is sometimes attributed to Henry Chettle c1560–c1607. Pears would later sing Francis Pilkington’s setting from his Booke of Songs or Ayres (1605) but the poem was also set by William Denis Browne, Ernest Farrar and E.J. Moeran. James Joyce’s collection Chamber Music comprises thirty-four transparently beautiful miniatures, of which Arthur Symons wrote: ‘They are like a whispering clavichord that someone plays in the evening when it is getting dark. They are full of ghostly old tunes, that were never young, and will never be old…’ Joyce hoped that some of the poems would be put to music in due course; in 1925, Frank Bridge obliged (apparently the first English composer to do so) and set the fifth of them as Goldenhair. This song was almost certainly Britten’s model and he later recorded it with Pears, thereby perhaps acknowledging the debt. His own setting, entitled more prosaically Chamber Music V (6), is marked for soprano or tenor but sung here transposed down a minor third. Britten’s song is much more restrained than Bridge’s but his teacher’s influence may be seen in the declamatory vocal line and opulent late-Romantic harmonies. These attributes also recall the works of John Ireland, although the song was written between 28 July and 3 August 1930, just a few weeks before the composer left Gresham’s School and began studies with Ireland at the Royal College of Music. The Rainbow (7) is one of his earliest published works, the second of Three Two-part Songs written in 1932 to words by Walter de la Mare. The other two songs in the set feature strict canonic writing for the voices but here, apart from some wordless imitative writing at the end of the song, that form is reserved for the piano. Its texture, in augmentation at one point, creates a sparkling tracery, a backdrop for the arching melody evoking de la Mare’s poem. Charles Wood is also noted for his canonic two-part songs but Who is Silvia? (16) is less well known. Written in 1891, it is a straightforward and uncomplicated setting, somewhat redolent of the composer’s church music or perhaps of house-singing at school when such events were more frequent than now. Despite its higher origins, a similar atmosphere pervades Silent worship (15), an adaptation of a solo aria ‘Non lo dirò col labbro’ from Handel’s opera Tolomeo of 1728. The English words by Sir Arthur Somervell are spurious additions to one of his favourite melodies, but the accompaniment is the work of Maurice Jacobson, sometime composition pupil of Busoni, Stanford and Holst, pianist to Kathleen Ferrier and doyen of J. Curwen & Sons. Vaughan Williams’s Dirge for Fidele (18) to words from Cymbeline, is also an early work and although not published until some years afterwards, it was probably written in 1895 when the composer was 22. Its tranquil melody is contrasted by a chant-like section at ‘No exorcisor harm thee’, although both words and music acquire much greater solemnity when removed from Shakespeare’s convoluted tragi-comedy, in which ‘Fidele’—actually Imogen, the daughter of Cymbeline, in disguise—fakes her death by accident and awakes shortly after the obsequies for her are ended. Compared to Britten, Charles Ives was a relatively late developer, although his first composition, written at the age of thirteen, was also a little dirge, in this case to commemorate the household cat. It was swiftly followed by other funereal offerings commissioned on the demise of neighbourhood animals. Slow march (20), written in 1887 when Ives was fourteen, is an affecting tribute to the family dog and bears the heading ‘Inscribed to the Children’s Faithful Friend’; Harmony Ives, the composer’s future wife, later wrote that it was indeed sung occasionally by local children. While the text is a joint effort between Ives’s uncle (one Lyman Brewster) and other members of the family, the immediately appealing melody is framed by a slightly simplified quotation from the ‘Dead March’ in Handel’s oratorio Saul. This is therefore one of the earliest examples of Ives’s propensity for incorporating music from disparate sources into his work. In the mornin’ (2) although dating from 1929 (when Britten was writing his student works), is surely typical of the Revivalist repertoire that Ives would have heard in and around New England when he became a professional organist in Danbury, Connecticut in the same year that he wrote Slow march. It was sung to him by a family friend, Mary Evelyn Stiles, who had heard it from her father. Her nuances and phrasing appear to have been an important element in his arrangement. Ives did not know the spiritual before and therefore chose his own title for it, as opposed to Give me Jesus, by which it is more usually known; however, he regarded it simply as ‘a modest accompaniment for practical purposes’ and excluded it from his seminal collection, 114 Songs. Sure on this shining night (24) written in September 1938 and later collected as the third of Four Songs, Op 13, is a setting of an untitled, heart-easing text from James Agee’s first collection of poetry, Permit me voyage. It is undoubtedly one of the great songs of twentieth-century America and has been compared favorably to nocturnes by Schubert or Schumann, to which indeed it bears some resemblance in its gently pulsing accompaniment, exquisite modulations and canonic interplay between voice and piano. There is textual affinity too with Agee’s Knoxville: Summer of 1915, a work also written in 1938, which Barber would later set for soprano and orchestra. By 1938 the great recital partnership of Pears and Britten was about to begin, for which many of the composer’s realisations and arrangements were made. Britten transforms his material in unexpected ways, propelling traditional elements into the realm of art song. All the songs in his first volume of folksong arrangements are dedicated to American friends. Little Sir William (9) is inscribed ‘To William Mayer’, the husband of Elizabeth Mayer whose family cared for Pears and Britten during much of their time in America. Its earliest-known performance by the duo was at the Cosmopolitan Club at 122 East 66th Street, New York, on 11 December 1940. The macabre tale of the boy-martyr has other counterparts in folksong: he is in fact more usually known as Little Saint (or Sir) Hugh of Lincoln, although apparently St William of Norwich suffered a similar fate. Britten’s setting has a boisterous, carefree accompaniment incorporating a deliciously catchy tag between verses, until the movement is suddenly arrested mid-flow as the boy’s ghost speaks. Much has been written about the composer’s leitmotif of innocence corrupted but it remains true that in setting this ‘curious story’, he foreshadowed his opera The Turn of the Screw based on the novel by Henry James, which is also centered on a schoolteacher who is at least partly responsible for a boy’s death. The words of Ca’ the yowes (14) are by Burns, who collected the tune in 1787, but Britten’s arrangement from his fifth volume of folksongs remains surprisingly little-known. The influence of Percy Grainger is apparent in its understated harmonies, with carefully-voiced chords and some glorious changes to the major key in the final refrain. When Britten arranged I wonder as I wander (1) he thought that it too was a traditional melody; however, although much indebted to an Appalachian tune, it is in fact an original work by the American composer and folksong collector, John Jacob Niles. Britten’s arrangement was a regular feature throughout his recital partnership with Pears—their earliest performance so far traced was given on 11 September 1942 at St Mary-le-Tower, Ipswich—but copyright difficulties long delayed its commercial recording and publication, although a live recording was made in 1963 during a recital in Leningrad, with Pears in glorious voice. Britten left the melody completely unadorned but reflected its modal contours in a single instrumental line to form a prelude, a postlude and three interludes, all slightly varied and subtly illustrative. Tom Bowling (21) is from Charles Dibdin’s ‘table entertainment’ entitled The Oddities of 1789 and was written to commemorate his brother Tom, who was lost at sea. Britten made only slight variations to Dibdin’s accompaniment, leaving the harmony basically unchanged. Although it is known that Pears and Britten included the original song in their recitals for many years before, the first documented performance in Britten’s realisation was given on 22 June 1959 at the Jubilee Hall, Aldeburgh. A most moving eulogy, its subject-matter now immediately recalls Britten’s great opera Billy Budd, whose fictional setting in 1797 is almost contemporary with the song. Tom Bowling gains further in poignancy when sung by a boy: a midshipman aboard HMS Indomitable after Billy’s death would surely have expressed similar sentiments. Equally appropriate to a boy is Malcolm Williamson’s My bed is a boat (23), which together with Sweet and low (25) displays the composer’s expert craftsmanship, his employment of straightforward yet melting harmonic sidesteps always at the service of his considerable melodic gifts. These two items are perhaps the finest from their respective cycles. From a Child’s Garden to words by Robert Louis Stevenson, was commissioned in 1967 by Alun Hoddinott for the Cardiff Festival of Twentieth Century Music and first performed by Robert Tear and John Ogdon on 24 April 1968. Six English Lyrics was completed in early 1966 and premiered in Manchester by Nancy Evans and the composer in April that year. Britten’s The Oxen (8) was written shortly afterwards in 1967, in response to a request by Peter Pears’s sister for the East Coker W.I. It is built around a series of slow-moving chords of sevenths, perhaps to suggest the trudging of the shepherds, while further descriptive touches appear above and below this motif. The first of these, the striking of midnight, recalls the clock depicted in another sleepless night, as described in the final song of Britten’s 1965 Pushkin cycle, The Poet’s Echo. Also made audible are the soft noises and moving of the cattle, the starry firmament and the pealing bells at ‘our childhood used to know’—under which the piano repeats its little figure as if Time has stopped—before the latter-day shepherds, doubtful but hopeful, resume their meditations and trace their imagined steps to join the beasts kneeling before the Christ-child. In 1971, Britten set a similar text as his fourth Canticle: T.S. Eliot’s Journey of the Magi. Also from the 1960s are Michael Berkeley’s brief but delightful Cradle Song (10) originally a choral piece but performed here as a solo song with the composer’s blessing; and, in complete contrast, The Slow train (13) by Flanders and Swann, from their revue ‘At the Drop of Another Hat’. This acutely touching response to the ‘Beeching axe’ mourns not only the passing of a mode of transport but the end of a way of life. It therefore carries, as William Plomer put it in his own poem The Last Train, ‘a weightless load of dissolving associations’, although some of the stations mentioned have since been happily re-opened. Their talismanic names, chosen of course for their aural resonance rather than any practical timetabled routes between them, might also represent some of the vanished American railroad junctions perhaps once known by Ives and his colleagues. The arrangement is dedicated to the joint memory of Michael Flanders, whose haunting poem inspired several walks along old railways, and Donald Swann, who was gracious enough to approve my elaborations. Peter Warlock rarely wrote a more beautiful cadence than that which closes The bayly berith the bell away (11) a perfect leave-taking to the poem’s euphonious, bewitching words which so attracted him. He had no idea of their meaning but this mattered little, since most of his contemporaries were similarly baffled. The verse is almost certainly a composite creation, possibly blending Christian imagery such as the sun shining through the glass—a mediaeval metaphor for Christ within the Virgin—with other Marian epithets (the Rose, the Lily) and the reverie of a child about to be married: having spent his last night in his mother’s bower, he awakes at dawn but complains he is too young to love. In this conjectural scenario, the floral references might also pertain to the coats of arms of the two families about to be joined. Caleno custure me (17) is another slightly mystical poem from the sixteenth-century, although the title is not Latin but may be a corrupted line of Irish, Cailín ó Chois tSiúre mé, ‘I am a girl from the [River] Suir-side’ or perhaps the Gaelic, Cailinog a stuir me, ‘Young love, my treasure’. The tune is referred to in Henry V and appears in a number of Renaissance publications, including Clement Robinson’s A Handfull of Pleasant Delights of 1584, to a poem described as ‘A Sonnet of a lover in the Praise of his Lady’. Once again, the principal influence on the arrangement recorded here is that of Warlock, who certainly knew the text. His close friend Elizabeth Poston was an expert on the music of William Boyce, yet her straightforward realisation of Tell me, lovely shepherd (12) from his serenata Solomon of 1743, has one curious anomaly. Boyce’s original air is a fairly swift dance-like movement, yet Poston’s arrangement is marked ‘Andante sempre con moto piacevole’. A comparison of Poston’s text with Boyce’s original in the authoritative edition by Ian Bartlett (Musica Britannica LXVIII) is highly revealing. Boyce’s second verse begins: Lest by the flocks I lonely stray / Without a guide and lose my way. Poston’s is identical but for the first word: Left by the flocks…The substitution of a single letter has therefore transformed a light-hearted warning into a forsaken lament. Was this the result of mis-transcription somewhere, perhaps through confusion between different forms of the letter s? If so, it seems unlikely that Poston was to blame: she worked extensively in the British Library and elsewhere and was a scrupulous editor. As the word ‘Left’ appears on three of her manuscripts of the setting, one of which has in addition the attribution ‘Words anon’, we have followed her lead. A particularly English pastoralism is characteristic of the works of Roger Quilter, yet his ripe nostalgia should not be allowed to overshadow his superb workmanship. Summer Sunset (19) is replete with his inimitable charm and dreamy harmonies. Quilter also wrote the words, although under the pseudonym of ‘Romney Marsh’, so becoming literally at one with his beloved landscape. Like Quilter, John Jeffreys (b1927) has often drawn on Elizabethan, Georgian and early twentieth-century texts. His restrained yet expressive language is a perfect counterpart to Matthew, Mark, Luke and John (22), a little orison of moving simplicity and quiet assurance. One of eighteen brief reflections of childhood, collectively entitled When I Was Young, it is given an artless melody that seems to have always existed, exquisitely harmonised, the pace deliberate and unhurried. Variants of the traditional verse, sometimes known as the White Paternoster, may be found throughout Europe and a version with an inventory of fourteen angelic guards was incorporated into Humperdinck’s Hansel and Gretel. It is singularly appropriate that a CD that celebrates Britten should close with a short group that evokes two of the composer’s most treasured conditions: night and silence. I was particularly keen to make this CD as I wanted a newer record of my treble voice: it has changed significantly since my previous recordings as a chorister. I also wished to promote items which are not normally associated with the standard treble repertoire. Through my association with Andrew Plant, The Britten-Pears Foundation generously supported the creation of the recording and allowed me the immense privilege of recording unpublished works by Britten, therefore greatly increasing the documental importance of this CD. I first met Dr Plant when he gave a lecture on English Song as part of an exhibition of Jane Mackay’s paintings at my old choir school, The Abbey School, Tewkesbury. In the spring of 2007 he asked me to sing at The Britten-Pears Library to launch the first joint publication by Jane Mackay and himself, The Turn of the Screw: Visual Responses to Britten’s Opera. James Bowman wrote the introduction to this book and was present at the launch. I enjoyed performing the music very much, my time at Aldeburgh, being able to rehearse at Britten’s own pianos in the Library as well as in his drawing room. Everything on that occasion confirmed the wish that this repertoire would be a central part of the solo CD I wanted to do. I asked Mr Bowman at the time if he would be happy to sing with me on the CD, and he agreed. Mr Bowman’s voice had been one of the first I had heard in recordings and live concerts. Later, as a chorister, I was lucky enough to sing with him when he was a soloist in performances of Messiah and the St John Passion. The chance to work with him made the prospect of the disc better than I could have imagined. Above all, it was great fun making this recording. I hope you enjoy it.